“Dogsbody Red one, Dogsbody Red one” came a call through the heavy background interference that was, and is, always present on the HF R/T. The ageing trainee controller perched uncomfortably on the hard saddle of the blue tricycle strained to hear the text of the message he was receiving over the unfamiliar R/T. “Vector 170 degrees, vector 170 degrees, Buster, Buster, Bandit Angels two zero, range twenty, over.” Struggling to compose and transmit acknowledgement of the message in the newly learnt R/T procedure, the “pilot” endeavoured at the same time to increase his pedalling rate to that required by the codeword “Buster”, and measured by the metronome, with its wagging arm, oscillating on the vehicle box in front of him. Setting the new course on the compass fixed between his knees the tricycle was turned onto the new heading. Cold and tired, exhausted with the effort of pedalling the heavy tricycle across the rough field, the “pilot” found that the compass needle refused to settle down. Exasperated and discouraged, he ceased pedalling, dismounted from his machine, lifted the rear wheel and dragged it sideways until the compass course lines were parallel to the compass needle. He then remounted and carried on with the interception. During WW2, tricycles were requisitioned to use as training vehicles for RAF personnel and various companies also supplied them to the Ministry. 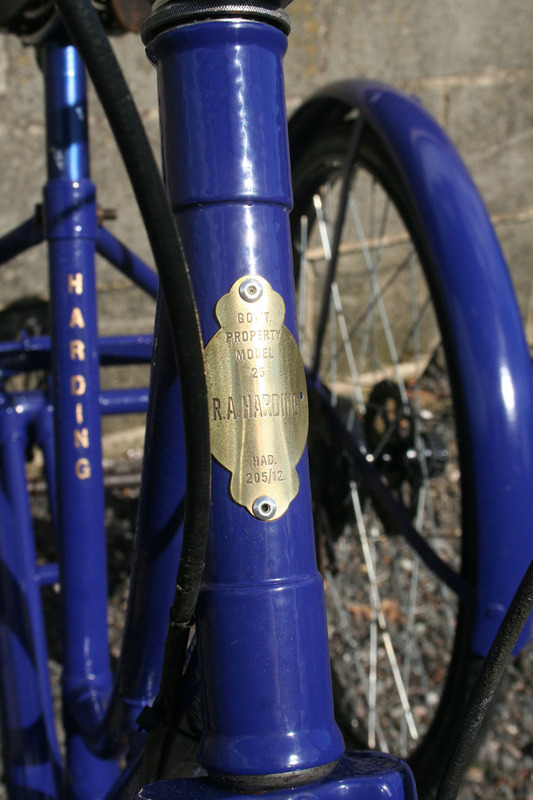 R.A. Harding of 19 Lower Bristol Rd, Bath had a history of Government contracts, and their catalogue illustrates a ‘Model 25 Safety Tricycle’ that was supplied directly to the government. This tricycle built by George Fitt Motors Ltd would appear to be part of the same contract. Some years ago I owned a similar Harding tricycle that was a Royal Air Force Training Tricycle, used for new pilots to get used to the idea of flying in formation. The CTU was initially formed at Headquarters (HQ) Fighter Command at on the 10 June 1940. It was originally intended that the unit should function at HQ Number 11 Gp, utilising the equipment and building of the old operations room, however, the scheme was abandoned and the Unit was formed in another old operations room at RAF Northolt. The tricycle school (see explanation later) which was used for simulating intercepts used the stadium at Uxbridge. In Oct the Army vacated the premises known as “Woodlands”, Clamp Hill, Stanmore which were subsequently handed over to the RAF, and became the CTU on 8 Nov 1940. The pilot R/T courses were now complete and the R/T unit moved from Uxbridge to Woodlands and augmented into the CTU along with the tricycle school. The Unit dealt with a considerable variety of courses for Sector Controllers, Flying Control Officers, Controller cadets (pre-commission), and other ranks of the RAF, United States of America, Dominion personnel, Czechs, Poles and other Allied forces as well as Army and Navy personnel. From the opening of the School in June 1940 until 25 December 1942 the number of students trained by the CTU was 2140, an average of just over 71 students per month! It should be mentioned that the CTU not only catered for Controllers but also ran Deputy Controller courses for NCOs and airmen and even Naval Fighter Direction Officers’ courses. The main room of the CTU was laid out like a normal Sector Operations Room of the time with a large GSM on the floor on which plaques were used to indicate the position, height, heading and speed of both fighter and target aircraft. At the foot of the GSM was a raised dais from which the controller issued his directions and orders. These were relayed over the R/T by deputy controllers on a smaller dais in front of and below him. In an adjacent room was the R/T fixer table on which the relative target and fighter positions were determined. To add realism to the controllers task of directing the fighter plaque onto the target plaque, whilst at the same time educating them on some of the problems facing their pilots, tricycles were acquired from a well known ice cream vendor to simulate fighter aircraft and their targets (21/22). The hostile or target tricycle, bearing a large red flag to show its identity and propelled by a U/T controller, was pedalled at a fixed speed and predetermined course across a nearby field. The aim was for the intercept controller to guide a similar but more elaborately equipped tricycle to intercept the target tricycle. Sporting a large blue flag, the interceptor tricycle was equipped with a compass mounted between the rider’s knees and an R/T set carried in the box section normally used for transporting the ice cream. A headset, volume control and transmit switch were also provided on the box in front of the rider. A metronome was fitted in front of the rider to enable the tricycle’s speed to be carefully regulated in accordance with the controller’s radioed instructions. On the signal for the exercise to commence, the target machine set off on its predetermined track across the field. Detected by visual observers around the field, the bearings were passed by phone to the fixer room, where the position of the target was fixed and passed as a position plot to the GSM. A decision to intercept was taken by the Sector Controller who ordered the fighter into the air. The “fighter pilot”, who was, presumably, the student controller who lost the toss of a coin, leapt onto his blue – flagged tricycle and reported, “Airborne” on his radio. Following the instructions given over his R/T set he proceeded on his bumpy way to intercept the enemy tricycle. Further bearings on the fighter were taken and these also were passed to the fixer room, there they too were converted to an appropriate grid reference and passed to the GSM. With continuous updates on the fighter and target’s positions the controller was able to direct a successful interception. Life was hard in the “good old days”. Despite a long and intensive search I can find no evidence that they would blindfold the cyclists to simulate night-flying! Further evidence for this type of training is contained in the F540, the one time classified operational record of a unit, for “Woodlands” for June 1944, I quote, “An interesting innovation on the tricycling field is the use of walkie-talkie R/T sets. Loudspeakers around the field have heretofore directed the airmen who take the part of the hostile bombers. This has had two distinct disadvantages, the first being that the loudspeakers were heard in the neighbourhood by residents, and the second the trainees taking part in exercises might take advantage by lifting the telephones from their ears and listening to instructions given to the bombers, thus being able to effect interceptions by improper means.” Surely this serves as an early example of intelligence gathering! These embryonic attempts to provide some standardised training for controllers may seem crude by today’s standards but fighter control in the early days obviously lacked the refinements modern days radar and communications. As an introduction to the art of Fighter Control, however, it served the Branch well and typified the spirit of the times when would be adopted to improve development and training, provided it was based on realistic principles.